A half hour after Hermantown defeated Greenway/Nashwauk-Keewatin for the Class 1A, Section 7 championship, Hermantown coach Pat Andrews was still out of breath. After a 5-4 double-overtime win that saw three lead changes and a game-tying goal in the very last second of regulation, who could blame him? His top-seeded Hawks had been pushed to the brink, but once again found a way to deliver under pressure and return to the state tournament. It was a game reminiscent of the previous year’s state tournament, in which the top-seeded Hawks needed overtime in each game to win the crown. Greenway, ranked No. 3 in the Class 1A coaches’ poll, rolled just two lines throughout the game, displaying its grit and strong conditioning as the Raiders went blow-for-blow with the No. 1-3A Hawks. 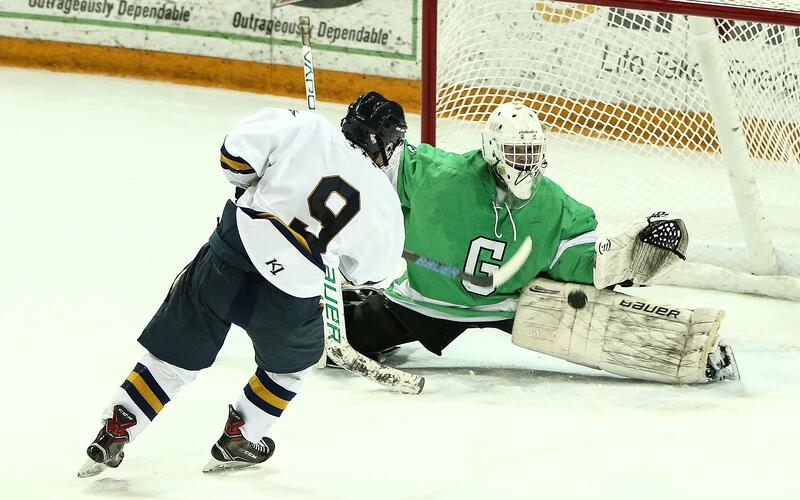 The first period went back and forth in its early stages, but Hermantown began to press the advantage as the period wore on. Sophomore Blake Biondi, a Minnesota-Duluth recruit, tallied the first goal of the game, a tight-angle rocket at 14:12 of the period. Greenway, however, responded in the second period, beginning a surge of its own. Nikolai Rajala imposed his will with hard-nosed play, putting the Raiders on the board at the 9:29 mark of the period with a shot from the left faceoff circle. 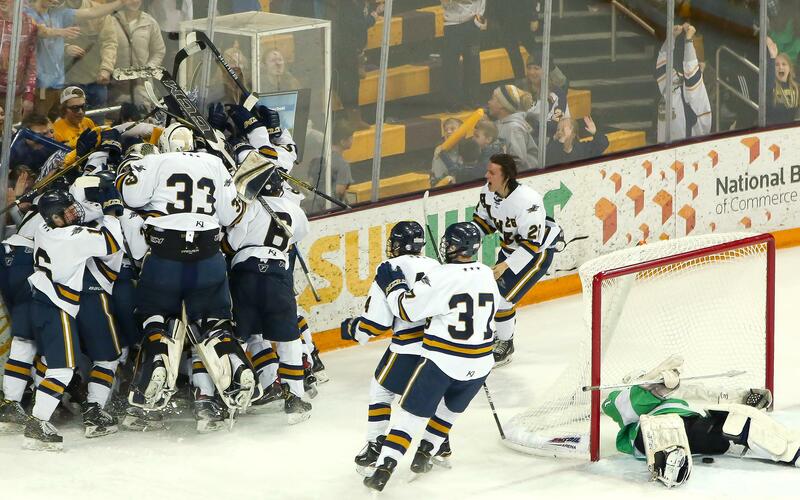 From there, the Raiders began to pile on, and Wes Johnson’s shot bounced off of Hermantown goalie Cole Manahan and trickled across the goal line to put them up 2-1 with just under two minutes remaining in the period. When Johnson scored again early in the third, the Hawks’ dynasty was suddenly on life support. The team, however, never panicked. Greenway bottled up the Hawks in the early in the third, but as the period wore on, the Hawks slowly began to assert themselves. Watkins, the captain and leading scorer with 25 goals and 41 assists, opened the comeback with 5:35 remaining in the third period to pull the Hawks within one, and it kicked off a barrage. Biondi followed with the game-tying goal, and just two minutes later, Brady Baker broke free and put the Hawks up 4-3. The Raiders looked spent, and the Hawks appeared primed for a return to the state tournament. But it would take a little more effort. A penalty on Darian Gotz with less than two minutes remaining gave Greenway some late life. The Raiders finally began to threaten as the clock closed in on zero, and sophomore Cameron Lantz somehow snuck the puck in with .1 second left, sending the Greenway contingent at AMSOIL Arena into delirium. The game featured none of the caginess that sometimes comes with overtime thrillers. Baker came free all alone in the first overtime, but goalie Ville Hyttinen flashed his glove to rob him to keep Greenway alive. The game remained open as it rolled along into a second overtime, with Hyttinen and Manahan each making their share of saves. After a number of quality Raider chances, the Hawks gained steam as the second overtime went on, and the top line of Watkins, Biondi, and Jacob Herter began to take command. Finally, with 14 seconds left in the period, Watkins hit paydirt to send his team back to St. Paul. 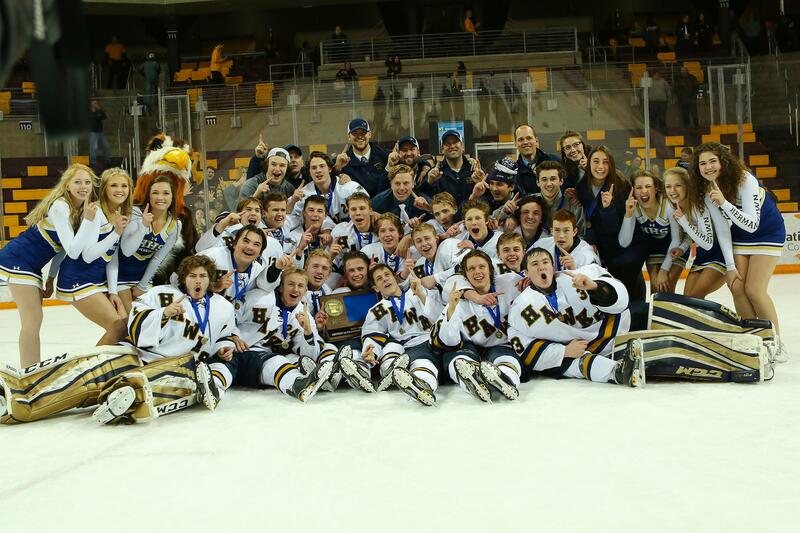 Hermantown (20-6-2) advances to a ninth consecutive state tournament, where the team will look for its third consecutive title. Greenway finishes its season 20-8, and with a second consecutive loss in the section title game.